"Boreal from the 2015 gallery"
This artwork should remind us though the piece is imaginative, we are not alone. I think it is self-centered thinking by the human race to believe we are a superior race and the only race that inhabits the universe. A very stunning depiction that the leaves me in a perpetual state of wonder. "Didnt notice it at first..."
There is another moon to the upper right of the plant. You can see it best at the highest resolution. However, there seems to be a halo around it without any stars. Ryan, this render is just wonderful as part of my after-Christmas lineup. So beautiful, cold, and clean -- absolutely perfect. Thank you for this one. The water...so still - the ice formations(bergs) - so jagged, yet perfect in their inconsistent edges; those color bands on Planet Alpha being pastels - surely the Master Race thereon is beautiful women, isn't it? Oh, beam me down there, Scotty! As usual, another beautiful wallpaper from you, Ryan. 'Tis glad I am to be a lifetime member. Thank you. As always, your use of colors and created atmosphere are truly a work of art. Congratulations on your continuous success! This is a test comment from the latest version of the iOS app. What if Ryan was building a solar system and we're seeing small glimpses of it with each new wallpaper? Each planet, each landscape, and each "character" play a small part in this world he's imagined. I'd love to see this view in a tropical version - similar to 'Above the canopy' but in this wider view with the water and the 'iceberg / island'. "There's just something about the juxtaposition..."
I'm not sure what resolutions this is on, but on 3840*1080 there seems to be a very obvious square without stars surrounding the moon. Looking at the 1080 single screen version it might be there also, but much smaller and less noticeable. This is clearly a work that would stay on my monitor for months. I can close all my windows, and step into the world that is beauty and grace. Keep them coming! I like it. It's a crisp clear day and you'd probably freeze to death if you fell in the water, but the colours behind the water give it a feeling of warmth. As written here often before: The new Boreal is one of the best winter wallpapers you ever made. Thanks a lot ! This is stupendous, magnificent, grand! I know this will be one of my all time favorites. It not only refers back to earlier DB images that I like, but also is in the spirit of classic space art! The icebergs frame the planet well. They don't totally look like icebergs, created from atmospheric gases, unlike oxygen. I love the scope of this, and the lack of visual clutter. It's sweeping, epic, and clean. Bravo! I am instantly taken with this one. One of the best of the year. I am really liking what is going on with the reflection. "One of your very best!" 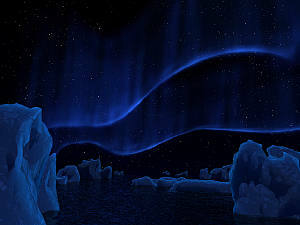 Although it is of an ice world it doesn't make you feel cold. It pulls me in to the far distant plant and makes me think 'if only'. Love this one. Simple and elegant. Will help me get through the rest of the work year! I've always preferred these types of enders. 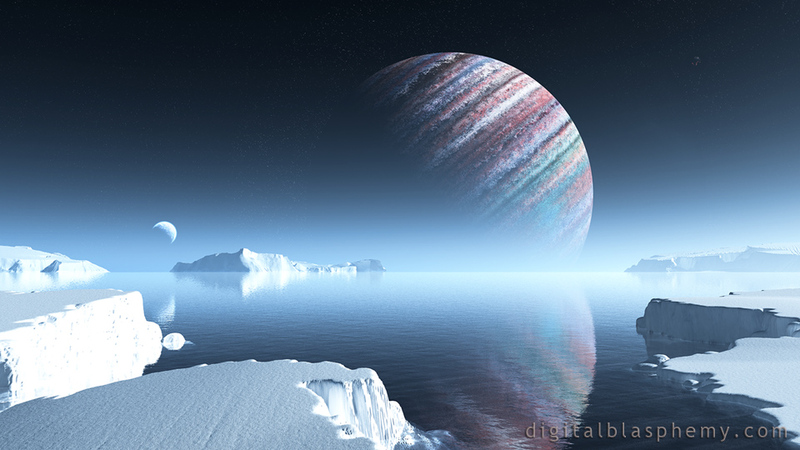 I love the starscape & planetscape images, and enjoy the simple elegance of these images. Boreal is no different in that regard. Neither Boreal nor Above the Canopy v2 have the 2560x1440 Lossless renders posted. Is this the start of a trend? Lovely. I like this one very much; it’s tranquil-looking and uncluttered. I think it’s perhaps a slight pity that the moon at the left changes position between the single- and multi-screen renders; it’s too close to the horizon for my taste in the single screen render. It’d look better (for balance) higher in the sky, even though we’d lose its reflection in the water. Ryan: a question. Why is the colour palette so different between the single-screen render and the multi-screen versions? I’ve noticed this frequently in other recent artworks. Generally the single-screen image has the best-quality, most subtle colour, and the multi-screen versions often look appreciably different (often more saturated). It’s the case here: although I don’t have strong feelings about which is better, the multi-screen renders look a lot more ‘blue’ than the single-screen version, which has a more (to me) natural appearance. I’m not saying I dislike the multi-screen renders (on the contrary, they’re great), but it does seem odd that the colour palettes should differ. Obviously it’d be better if the renders could all use consistent colour. This is gorgeous! I like this so much better than the first version.